We’d love your help. Let us know what’s wrong with this preview of Swimming for Sunlight by Allie Larkin. Aspiring costume designer Katie gave up everything in her di When recently divorced Katie Ellis and her rescue dog Bark move back in with Katie’s grandmother in Florida, she becomes swept up in a reunion of her grandmother’s troupe of underwater performers—finding hope and renewal in unexpected places, in this sweet novel perfect for fans of Kristan Higgins and Claire Cook. To ask other readers questions about Swimming for Sunlight, please sign up. What first got my attention to this book was of course the cover! That sweet little pup on the cover stole my interest :). I cannot say enough good things about this sweet sweet novel! This was the perfect book to come into my life right now! If you're thinking this is going to be a romance novel.. you're completely wrong. Allie Larkin explores love, friendship, overcoming your fears, anxiety, and happiness in this beautiful novel. Between the fury rescue pup Bark, the mermaid team of hip grandmas What first got my attention to this book was of course the cover! That sweet little pup on the cover stole my interest :). Between the fury rescue pup Bark, the mermaid team of hip grandmas, to the loving, complex, and resilient set of characters this is one book that you want to get your hands on! You will not be disappointed! I highly recommend. Thank you to Atria and Netgalley for the arc in exchange for an honest review. Katie is an aspiring costume designer, and I knew she was my kind of gal when I read she gave up everything in her divorce settlement- everything- in order to keep her rescue dog. At a loss on what her next steps should be, Katie moves home to Florida to live with her grandmother. Her former underwater performer grandmother. Nan was a mermaid performer in a roadside show, and she had a group of close friends who performed with her. Unfortunately, the women lost touch over the years, but Katie helps Nan find her friends via social media in hopes of reuniting them for one more show. Of course, if this happens, Katie will make the costumes! Katie’s college boyfriend, Luca, re-enters the scene. Now a documentary filmmaker, Katie is feeling sparks between them. Katie has a real battle between all of her dreams and her anxiety holding her back from obtaining them. She makes a connection between her own fear and the anxiety her dog experiences. This aspect was SO sensitive and well-done, it melts my heart just thinking about it again. Swimming for Sunlight is a charming and moving story. If you are a lover of dogs or any animal, you can’t miss it, and even if you aren’t, this is a beautiful story that is sure to capture your heart like it did mine. Will Katie and Bark find their happily ever after? Melissa Crytzer Fry Glad you loved this one, Jennifer. I enjoyed your review. Swimming for Sunlight is an uplifting story full of love, friendship, growth and multi-generational comradery that will fill your heart with joy from beginning to end. Katie Ellis suffered a double loss as a child; her father died of a heart attack as they were playing in the water and her mother abandoned her shortly thereafter. As a result, despite an abundance of love from her grandmother, Nan, and the caring of all of Nan’s friends, Katie suffers from debilitating anxiety disorder which now h Swimming for Sunlight is an uplifting story full of love, friendship, growth and multi-generational comradery that will fill your heart with joy from beginning to end. Katie Ellis suffered a double loss as a child; her father died of a heart attack as they were playing in the water and her mother abandoned her shortly thereafter. As a result, despite an abundance of love from her grandmother, Nan, and the caring of all of Nan’s friends, Katie suffers from debilitating anxiety disorder which now has cost Katie her marriage. The one thing she has fought for and won in the divorce settlement is her faithful-fearful dog, Bark. Now Katie is moving back in with Nan to be surrounded once more by a wonderful community of friends. As someone who suffers from extreme social anxiety, I related to Katie and her faithful pooch very much. As she plunges herself into helping her Nan reconnect with Nan’s friends from the past, Katie slowly begins to heal and we, as readers, are able to see her growth – after a harrowing fall to the very bottom of an emotional fallout. It is through the help of the community, her own childhood friends and the love of her dear pet that we watch Katie learn to deal with her anxiety – and that of Bark’s as well. There are a number of characters in Swimming for Sunlight in addition to the primary ones of Katie and her Nan and each play an integral part in the story. Larkin does a beautiful job of developing them to their fullest, slowly revealing their true nature so that we see their strengths and weaknesses as well, just as we would our own friends and neighbors. She then weaves their storylines in with Katie’s brilliantly. I loved Swimming for Sunlight. It came into my life at exactly the right time when I needed it most and filled it with warmth and happiness. I hope it will do the same for many other readers. So "Swimming for Sunlight." I went back and forth on this one. The main character is Katie Ellis who divorces her husband and takes her rescue dog Bark back to Florida to stay with her maternal grandmother, Nan. Katie gives up everything that she is entitled to so her husband doesn't get joint custody of the dog. So she arrives with paper bags filled with clothes and I kid you not when your grandmother q Please note that I received this book via NetGalley. This did not affect my rating or review. So "Swimming for Sunlight." I went back and forth on this one. The main character is Katie Ellis who divorces her husband and takes her rescue dog Bark back to Florida to stay with her maternal grandmother, Nan. Katie gives up everything that she is entitled to so her husband doesn't get joint custody of the dog. So she arrives with paper bags filled with clothes and I kid you not when your grandmother quizzes her about not getting cardboard boxes she explains her dog, Bark, doesn't like them. I should have known what I was getting into from that point. Katie was a freaking martyr and didn't even see it. She was also causing her dog severe anxiety due to her actions. I did feel sorry for her. She was there when her father died and she pulled him from the lake they were swimming at. Cue her mother dumping her to live with her grandmother while she followed men all over the world and stopped communicating with her. So there is sympathy for Katie, but I got annoyed at how she dealt with everything. She tells her grandmother Nan that Bark can't be walked since he is so scared so they dance around the living room for exercise. Yeah my face is your face right now. Katie also can't handle going to funerals since it reminds her of her father so she's been largely absent with her childhood best friend who lost two grandparents and her grandmother's best friend who also lost a spouse. Everyone just excuses it and it drives me up the wall. And then we finally get into the one who got away and once again it was 100 percent her fault and I just hard sighed when we finally read about what tore them apart. That said, Katie didn't deserve the break up of her marriage due to her husband's cheating and though she seems to have found a sense of closure in the end I just rolled my eyes. Larkin doesn't spend much time developing secondary characters past a few people such as Nan, Bunny, Mo, Mr. Issac and Luca. Other characters drop in and drop out with Katie getting "insight" into them. Not enough to stop being a drama queen though. I get she has abandonment issues but good grief. Luca was the most patient person in the world. I really wish there had been more discussion between them when it finally comes out what caused them to end back in college. It felt like such a flimsy BS excuse that if I were Luca I would have been done at that moment. For me, how can you trust that you won't do something else the person won't like and they won't push you away for years. That said though I couldn't put this book down. I loved reading about how Katie came to love sewing and show she got into costume work. Her working at Mr. Issac's shop was highlight and her doing research on how to create her grandmother and the other "mermaids" outfits was interesting. I got so curious about underwater costume work and makeup after reading this book. The writing starts off slow at first and the flow was a bit off at the beginning. I think that's because as readers we are reading Katie tell her story in her own way and for the most part she is trying to hide things from herself and has to lie to herself that her dog is fully dependent on her so she has reasons to say no to doing anything. The setting of Florida didn't feel like a proper setting though. I think because most of the book takes place at Katie's grandmother's home, Mo's house and Mr. Issac's shop. We read about it, but I can't recall if Larkin described the smell of the ocean being nearby, the humidity, etc. This could have taken place anywhere. 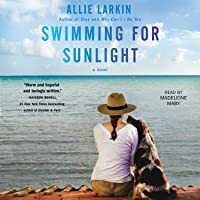 I received a free advanced e-copy of Swimming for Sunlight by Allie Larkin from NetGalley for my honest review. Oh my, where to start. Such a beautiful, moving, emotional and memorable book. Katie and her dog, Bark go to Florida after her divorce. Katie, is young, depressed and is struggling with anxiety and fears as well. She is also still mourning the loss of her father. She ends up moving in with her Grandmother (Nan). Katie learns that Nan was a mermaid performer back in the day. Katie decide I received a free advanced e-copy of Swimming for Sunlight by Allie Larkin from NetGalley for my honest review. Katie learns that Nan was a mermaid performer back in the day. Katie decides to help Nan reunite with her Mermaid friends from the past. They contact all the Mermaids, wanting to do a reunion show. While all this is happening she also learns that her Ex husband is in another relationship and is happy but she is heart broken. Katie starts to find her own peach and healing process when she decides to make costumes for Nana and all her friends for the reunion show. Brandice This sounds good, nice review, Selena! Mary Beth *Traveling Sister* Wonderful review, Selena! I love mermaids, I even collect them. This looks like an emotional cute book. Rich in details and brimming with emotions, this book pulled me in and captivated my attention each time I picked it up to read. It pulls at your heartstrings as protagonist, Katie, and her dog, Bark, help each other with anxiety issues, and as Katie helps Nan reunite with her friends from the past to become a beautiful group of senior mermaids. A wonderful, light, and poignant read. 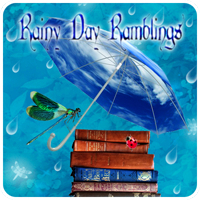 I reviewed a digital arc provided by NetGalley and Atria. Thank you. LOVE LOVE LOVE this book. Trust me. Just read it. Warm and delightful and bursting with empathy. When Katie gets divorced all she wants out the marriage is her rescue dog Bark. Katies moves back home to Florida with her grandmother and her quirky group of friends. Katie learns all these things about the past and her grandmother. Nan was an underwater mermaid performer. While Katie helps her grandmother find her lost friends and bring back the troupe of mermaids,Katie discovers how much her tragic past and her fears and anxiety are holding her back. Holding Bark back as well. I loved this st When Katie gets divorced all she wants out the marriage is her rescue dog Bark. Katies moves back home to Florida with her grandmother and her quirky group of friends. Katie learns all these things about the past and her grandmother. Nan was an underwater mermaid performer. While Katie helps her grandmother find her lost friends and bring back the troupe of mermaids,Katie discovers how much her tragic past and her fears and anxiety are holding her back. Holding Bark back as well. I loved this story! It's spunky, lyrical,full of hope and promise. A tale of connecting with family, lost friends and past loves. I can't say enough how much I loved it. Stunningly beautiful. I was given a copy by the author for my honest review. SWIMMING FOR SUNLIGHT by Allie Larkin is such a perfect way to spend the day. Be prepared to ignore everything else until you are done. All I wanted to do when I finished reading was to reach out and give Katie and her grandmother Nan a big hug. Katie is recently divorced and basically, takes her rescue dog, Bark, a few bags of clothes, and runs to Nan’s. To say that Nan has an interesting bunch of friends, would be a huge under statement. When Nan and her friends were younger, they were underwa SWIMMING FOR SUNLIGHT by Allie Larkin is such a perfect way to spend the day. Be prepared to ignore everything else until you are done. All I wanted to do when I finished reading was to reach out and give Katie and her grandmother Nan a big hug. Katie is recently divorced and basically, takes her rescue dog, Bark, a few bags of clothes, and runs to Nan’s. To say that Nan has an interesting bunch of friends, would be a huge under statement. When Nan and her friends were younger, they were underwater performers. Katie is a costume designer and as Katie helps her Nan reconnect with her old friends who also performed with her, she ofcourse, will be making their mermaid costumes. Katie also decides to look up her old college boyfriend, Luca. There isn’t a whole lot of romance in this story, but you have to read SWIMMING FOR SUNLIGHT to find out what happens! You are going to love where this story takes you! All the while, Katie is trying to overcome her anxiety and the issues she has carried for years with the death of her father. She was with him when he died and the internal battles she continues to fight will just break your heart. Bark has his own anxiety issues, but I felt like Katie created most if not all of them. I fell in love with all of Allie’s characters and SWIMMING FOR SUNLIGHT did not disappoint all I had been hearing about it. Reading this perfect and heart warming book was like visiting with old friends. I loved learning how Katie became interested in sewing . Even though everyone is in everyone else’s business just enough to drive them all crazy, it was still a fun as well as an emotional story for me. They all try to help Katie heal and find her happily ever after. I can’t wait to read more from Allie Larkin. Carlene Inspired Lovely review! I am very interested in this novel. Susan I hope you get a chance to read it! It so cute! Thank you to Netgalley and Atria books for this ARC - it was a surprisingly delightful book and I am proud to be able to review it. I started this book with an apprehensive spirit to be honest - I was worried it was going to be a run of the mill romance novel. Thankfully I was wrong, it is a romance but it is also a bit of family drama, BFF reinforcement and an awareness raiser. I was happily proven wrong. The fact that Katie starts off her story in the divorce court with the ‘new’ woman sat outsi Thank you to Netgalley and Atria books for this ARC - it was a surprisingly delightful book and I am proud to be able to review it. The fact that Katie starts off her story in the divorce court with the ‘new’ woman sat outside waiting for Eric to come out is traumatizing to say the least, she then travels to Florida to Nan’s house manifesting every form of neurosis possible. I have to admit at this point I wanted to give her a slap and tell her to get it together. She goes through all of her phases of grief and mourning in front of all the people who love her the most, and she shows every side of herself in stark reality - some nice bits and some not. Ultimately you realize she is grieving not only the breakdown of her marriage but every loss and hardship she has ever faced in her life. Some of which are awful and lead to many facets of her neurological anxieties. In opposition to Katie’s maladies Larkin give us Nan and her mermaids who are such a delight to behold. I literally wanted to be in that group of women, funny and eccentric in just the right way. Mo - oh Mo - she is by far my favorite. Old before her time, awkward and most of all loyal and honest. She is Katie’s BFF and her quips and responses were brilliant, some of her quirks and responses are laugh out loud material, I caught myself using her catchphrase ‘hilarious’ to describe her and also having to smile apologetically at people within earshot of me as I laughed at her and spoke out loud in response to her. Hilarious! Obviously the romance side of things cannot be ignored and I must say Larkin wrote about it as realistically as possible for a fundamentally flawed Katie, no romance is going to be easy with someone who is always waiting for a bomb to drop. Luca is everything a broken woman needs and he is good for her and softens her as a character - which means you start to like her even more when you see her through his eyes. The words that ran through my head as I read Swimming for Sunlight were endearing, delightful and extraordinarily heartfelt. Allie Larkin has written a story about starting over when the odds have beaten you down time and time again and she has done so in a way that makes you want to reach out and hug our protagonist, Kay and of course, Kay's delightful rescue dog, Bark. More than that, Larkin has created a dream of a character in Kay's grandmother, Nan. 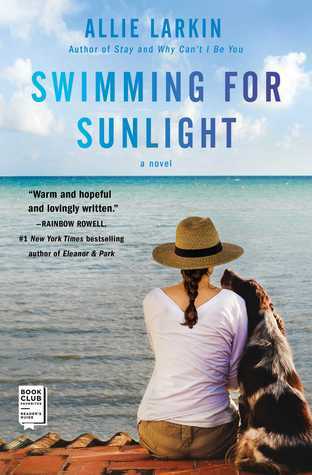 Nan raised Kay for most of her life and e The words that ran through my head as I read Swimming for Sunlight were endearing, delightful and extraordinarily heartfelt. Allie Larkin has written a story about starting over when the odds have beaten you down time and time again and she has done so in a way that makes you want to reach out and hug our protagonist, Kay and of course, Kay's delightful rescue dog, Bark. More than that, Larkin has created a dream of a character in Kay's grandmother, Nan. Nan raised Kay for most of her life and embodies the type of person we all hope to have in our lives - whether as friend or family. With tons of heart, humor, love and MERMAIDS (naturally, you'll need to grab a copy for more on this), Larkin surely has a hit on her hands with Swimming for Sunlight. I loved loved LOVED this book! In “Swimming for Sunlight,” Allie Larkin has written an absorbing, insightful tale of all the people and places in which we find strength. She's created a world I’d love to live in, full of vividly rendered characters who are as complex and resilient as they are big-hearted and funny. There is nothing like a great story, well-told; this is Larkin’s specific expertise. Thank you to Netgalley and Atria books for ARC - it was a surprisingly delightful book and I am proud to be able to review it. The fact that Katie starts off her story in the divorce court with the ‘new’ woman sat outside wa Thank you to Netgalley and Atria books for ARC - it was a surprisingly delightful book and I am proud to be able to review it. In opposition to Katie’s maladies Larkin give us Nan and her mermaids who are such a delight to behold., I literally wanted to be in that group of women, funny and eccentric in just the right way. Mo - oh Mo - she is by far my favorite. Old before her time, awkward and most of all loyal and honest. She is Katie’s BFF and her quips and responses were brilliant, some of her quirks and responses are laugh out loud material, I caught myself using her catchphrase ‘hilarious’ to describe her and also having to smile apologetically at people within earshot of me as I laughed at her and spoke out loud in response to her. Hilarious! Four and a half stars: A beautiful book about conquering your fears, overcoming the past and finding a bright new future. Katie chatters all the way to Florida to her beloved dark, Barkimedies. Katie is heading home after her divorce to live with her Grandma Nan. Katie has no idea what she will do, but she and Bark hope to do it together. Once she arrives home, Katie and Bark are still crippled with fear and anxiety, but they slowly begin to overcome their fears. Katie heals by sewing costumes f Four and a half stars: A beautiful book about conquering your fears, overcoming the past and finding a bright new future. Katie chatters all the way to Florida to her beloved dark, Barkimedies. Katie is heading home after her divorce to live with her Grandma Nan. Katie has no idea what she will do, but she and Bark hope to do it together. Once she arrives home, Katie and Bark are still crippled with fear and anxiety, but they slowly begin to overcome their fears. Katie heals by sewing costumes for Nan and her friends so they can relive their glory days as mermaids. Bark takes baby paw steps as he learns to be a better dog. Will Katie and Bark be able to escape their fears? *I went into this one expecting it to be a nice romance, but I got so much more. This really isn’t a romance at all. Instead it is a book about conquering your fears, moving forward, finding your way and most of all about love and friendship. I loved this book. *This is a book about growth. I loved following Katie as she worked to overcome her past. In the beginning she is a mess. Slowly as Katie spends time with her grandma and her friends, she begins to work through her fears and find her courage. It is a slow process, she fights hard, and in the end, she makes significant progress. It was a joy to watch Katie grow and evolve. *I adored Nan and her friends. I hope when I am an old lady, I will have a zest for life like Nan. It was so fun seeing Nan reconnect with her old friends and relive her past. I loved following the women as they created the documentary. Such a joy. *There is a tiny bit of romance, but like the rest of the book, it is more focused on friendship and healing. I liked seeing the old friends reconnect and find that spark again. Bark is a treat. At first, he is this dog who has severe anxiety issues, but just like Katie, he learns to overcome his fears with some extra love. He was the perfect companion for Katie. *The book ends on a positive note that left me feeling good. I hated to let go, but I was thrilled to see how far Katie had come. This book was a joy from beginning to end. *Even though I was not disappointed at all that this wasn’t a romance, I wish that there had been more development with the romance. I wanted to see it unfold more. *I felt a bit cheated when it came to the big finale of the mermaid documentary. After all the buildup, I wanted to see it in action, but that doesn’t happen. Swimming for Sunlight is a delightful book. This is a book about growing, changing, overcoming fear and friendship and love. There is so much to love about this book. It is a lovely, positive feel good read that left me wanting more! Definitely read this one! Swimming for Sunlight is the literary equivalent of a chocolate chip cookie just out of the oven, warm and soft in the center. I loved the setup - Katie trying to salvage her emotional well-being by just giving up everything in her divorce except her dog definitely felt like something I might do in similar circumstances. She goes home to a group of elderly women who offer unconditional love and gently shepherd her as she learns to face (and finally deal with) her anxiety. I liked how nobody here Swimming for Sunlight is the literary equivalent of a chocolate chip cookie just out of the oven, warm and soft in the center. I loved the setup - Katie trying to salvage her emotional well-being by just giving up everything in her divorce except her dog definitely felt like something I might do in similar circumstances. She goes home to a group of elderly women who offer unconditional love and gently shepherd her as she learns to face (and finally deal with) her anxiety. I liked how nobody here is *really* the bad guy. Her husband seems like a complete a**hole at the beginning, but through the course of the story we come to see that he, too, is just attempting to find some happiness, even if he goes about it the wrong way. I also liked how Katie definitely has challenges she needs to face, but it's nothing life-threatening or over the top. It's basically her journey toward making the choice to love herself and improve her own life, not just for her own sake but because she also knows the people around her love her and want the best for her, too-- including her dog, Bark! A wonderful book that makes you root for the characters and it's full of emotion. I was moved and rooted for the characters. I loved the style of writing, the cast of characters, both human and canine, and the plot was engaging. I will surely look for other books by this writer. Great light but meaningful reading. Allie Larkin did a great job of taking the reader into the world of a seniors' community in Florida, as a newly divorced young woman moves in with her grandma. We see Kate renew childhood friendships with her grandma's friends and with her own high school BFF. This book's a nice picture of the lives of active seniors and the sense of community and lifelong friendships they enjoy and offer to a needy younger woman - all set against a project to re-unite a group Great light but meaningful reading. Allie Larkin did a great job of taking the reader into the world of a seniors' community in Florida, as a newly divorced young woman moves in with her grandma. We see Kate renew childhood friendships with her grandma's friends and with her own high school BFF. This book's a nice picture of the lives of active seniors and the sense of community and lifelong friendships they enjoy and offer to a needy younger woman - all set against a project to re-unite a group of mermaid showgirls. Thanks to Netgalley and the publisher for an ARC! The hardest reviews are the ones where I'm middle of the road on a book for an author I really enjoy. I LOVE Allie Larkin so was so excited to read this. I loved the interaction between Kay and Mo and I wish there was more of it in the book. Most of the time I was left feeling frustrated with Kay's decisions but at times I understood her difficulties. I personally didn't relate as much to her relationship with Nan's friends - often times I found Thanks to Netgalley and the publisher for an ARC! A thoughtful, tender story about losing everything and starting all over again, Swimming for Sunlight reminds us of the joy that comes when we open our hearts to unexpected friendships. I fell in love with Allie Larkin's quirky and endearing characters and found myself thinking about them long after I turned the last page. Swimming for Sunlight was my first time reading Allie Larkin’s work. It is a lovely story about love, friendship and second chances. I adored all the characters. Grandmother Nan and her friends are fabulous! I fell for the anxiety-ridden heroine who struggles to cope daily; I wanted to hug her, hold her hand, and also give her a little shake for projecting her fears onto her dog. Katie’s backstory is tragic, and it is probably a little bit more so than needed. However, it does set up the reason Swimming for Sunlight was my first time reading Allie Larkin’s work. It is a lovely story about love, friendship and second chances. I adored all the characters. Grandmother Nan and her friends are fabulous! I fell for the anxiety-ridden heroine who struggles to cope daily; I wanted to hug her, hold her hand, and also give her a little shake for projecting her fears onto her dog. Katie’s backstory is tragic, and it is probably a little bit more so than needed. However, it does set up the reason she ends up being raised by her grandmother, Nanette, as well as why she returns to her home. Layed-back Luca is a dream. Handsome, creative, giving, and totally chill, he is the absolute opposite of Katie, and exactly what she needs. I didn’t care for Luca’s backstory, and I felt it was an unnecessary addition of the author’s political opinion that detracted from the story. By far, the best characters are the secondary characters. Katie’s childhood friend, Maureen, is perfection. She is a devoted friend who sees Katie, and not only accepts every bit of her, but treasures all her “perfects and imperfections”. Nanette (Nan) and her friends are spry seniors who love every minute of life! From “martooni” parties to “mermaid” aqua-aerobics classes, they’re delightful. This senior community, was essentially, the village of caring people who helped raise Katie. Their current living situation and friendships are what most people hope for in their golden years. The plot is well paced, and the story is creative. I thought there would be a little more focus on the mermaid story with Luca and Katie creating a historic documentary, but this tale was about Katie--and her dog—finding her way after yet another calamity in her life. In addition to the currently popular politics being inserted into the story, there were a few other things in the story that didn’t work for me. The divorce scene is a bit unrealistic; I doubt a lawyer would have precisely proceeded with Katie’s final decision (and shame on Katie for allowing her anxiety to push her to fall for her soon-to-be-ex-husband’s game). However, it sets the scene and creates a need for Katie to return home. Author Larkin respectfully presents Katie and her anxiety disorder. She realistically portrays the lack of understanding and response most people would have to someone with an anxiety disorder. I also appreciated the presentation of the marvels of social media helping people reconnect as well as the downside of comparing your circumstances with the seemingly-perfect lives presented on sites like Instagram and Facebook. A fine example was Katie’s “stalking” of the new woman in her ex-husband’s life, and all the unnecessary turmoil it brought. It’s something you know isn’t going to be good for you, but the pain will eventually help you move on. Ms. Larkin gives her readers a charming story about the friendship of women and how the support from your family and your tribe allows you to be the best you possible. "Swimming for Sunlight" by Allie Larkin is about a young divorcee trying to overcome trauma as she returns home to live with her grandmother. She begins helping her grandmother and friends become the entertainment mermaids they used to be decades before. It's heartwarming yet slow without the pizzazz in telling everyday situations and depicting everyday characters. Katie returns home to Florida after a tumultuous divorce that ended with her ex-husband shacking up with the younger woman he had an affair with. So Katie is out of sorts bringing her dog Bark, also suffering from anxiety, along with her as she's still reeling from the effects of a marriage that resulted in two post-IVF miscarriages. And she never got over her father's unexpected death on the water when she was a kid and her mother's subsequent abandonment. When she gets to her grandmother Nan's home, she's welcomed back into the senior community she was raised in. Nan has changed with adapting a vegan diet while some of her friends have passed who had a hand in raising Katie like her aunt Bitsie's wife Bunny who had taught Katie to sew. The ladies talk one night about their days performing as mermaids in circus shows. They want to replicate those days, so to get her mind off things, Katie takes up the cause with searching on Facebook for their old friends who were also mermaids and volunteering to sew the mermaid costumes. While searching on Facebook, Katie sees the other guy she had fallen in love with in college before her ex-husband and sends a message. Eventually, Luca arrives in Florida to shoot a documentary on the mermaid project. Katie's best friend Mo tries to get her out of the house more and spark another romance with Luca. In the end, Katie overcomes her fear and anxiety as if she is a mermaid. The story again moves slow without much excitement; the events are ordinary, the characters are ordinary. The mermaid project itself is the steps of putting it together, which doesn't seem exciting like they're cruising Facebook, going to each other's homes, sewing, etc. and the tension isn't strong enough to come off as interesting. In simpler terms, it gets boring, but the reader can empathize with Katie, who struggles with coming to terms with her past like getting over her father's death and walking away from Luca. Character development is fine. The backstories are there with Katie's father dying and mother leaving her with Nan; Mo also being raised by her grandparents; and Luca, whose mother was deported, or maybe these are all coincidental. Overall, the story and characters have potential but need more energy so the reader's eyes won't glaze over. Katie goes back to live with her grandmother when her own divorce is finalized. She brings her best friend, her dog, Bark. Katie has major anxiety issues. She owns up to some responsibility in her divorce because she pushed her husband away when things got hard. The only ones she’s always trusted are her grandmother, her dog, her best friend Mo and her grandmother’s circle of friends. So when she’s hurting, she goes home for comfort. She isn’t expecting to see her grandmother super skinny and on a h Katie goes back to live with her grandmother when her own divorce is finalized. She brings her best friend, her dog, Bark. She isn’t expecting to see her grandmother super skinny and on a health kick. Katie’s anxiety causes panic attacks at times. And she’s been afraid of the water for most of her life after her father’s death. So her grandmother’s history as a live mermaid was never much discussed. But when her and Nan start talking about the old days, NaN mentions her old life and friends she hasn’t seen in years. Katie decides to help reunite Nan’s mermaids, she is even making them gorgeous mermaid costumes. She has good intentions but her anxiety is a constant battle. For instance, she loves her dog Bark so much. Bark has anxiety too and Katie would do anything to ease it. But at a certain point, you have to notice that Katie’s anxiety over Bark is probably making him worse. I personally have a cat with anxiety issues, so I can relate to how they need special treatment that someone else might not understand. But it would be heartbreaking to think the way you handled it was making it worse rather than better. This book felt really heavy at times. I couldn’t read entire panic attacks written word for word here. There were lines I had to skip when Katie repeatedly detailed her fears about Bark. I don’t have anxiety issues but Katie made me feel borderline panicked myself when I read some of her diatribes. I assumed the author might also deal with anxiety issues because this seems like a topic you’d be more inclined to represent properly if you’ve gone through it yourself. I had to take a break a little ways into the book, maybe around the 40% mark. It’s not anything that happened in the story, I just felt bogged down and needed a happy story to break it up for a bit. But I did resume the story and I did finish it. I was glad to see Katie the rest of the way through this journey. As Katie’s college love Luca, a documentary filmmaker enters the fray, Katie struggles to balance her hopes with her anxiety and begins to realize just how much Bark’s fears are connected to her own, in this thoughtful, charming novel about hope after loss and friendships that span generations. The book is wonderfully written in an easy, breezy style that makes it a fun, sunny read (pun intended!) and it is the perfect beach read - take it on vacation with you!!! !